For details on any of our products click the ‘More Details’ link associated with each product. NOTE: If you purchase a download product the link to download the product will be provided in the email you receive once your purchase transaction is complete. The download product is free of tax and shipping and handling, and can be enjoyed immediately. 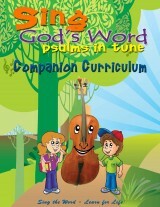 Click here to view the Psalms in Tune Curriculum User’s Guide page. Click here to view the Way to Praise Curriculum User’s Guide page. 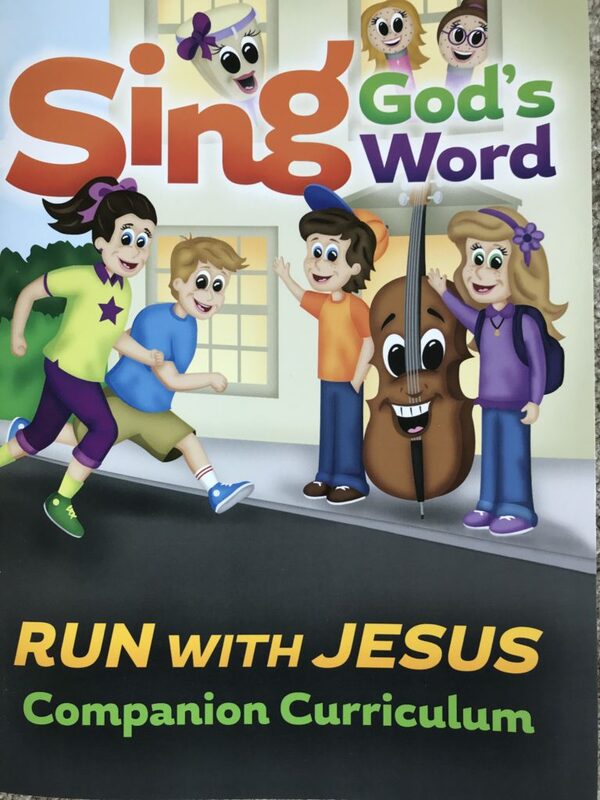 Click here to view the Run with Jesus Curriculum User’s Guide page. This simple Bible curriculum was created for a Sunday school class containing a mixed age group of children, or for early elementary school classes. It is our hope and prayer that this Bible curriculum will provide an easy way for you as a teacher to make the most of the devotional aspect of Sing God’s Word – Psalms in Tune. As the children learn the words and music, adequate lessons with visuals and movement will confirm the message from the main verse and help the students understand how these verses can be applied in their daily lives. May your desire to teach the Word of God to children bring as much joy to you as it brings eternal benefits to them. SPECIAL NOTE: Purchaser is granted permission to make copies necessary for teaching in one class unit, not to exceed five copies from one purchase of the Bible curriculum. Personal use is limited to two copies only. The download link for the Coloring Pages is included with this purchase. The specific link will be sent to you by email once your purchase is complete. Tax (if applicable) and shipping and handling will be applied at checkout. This simple Bible curriculum was created for a Sunday school class containing a mixed age group of children, or for early elementary school classes. It is our hope and prayer that this Bible curriculum will provide an easy way for you as a teacher to make the most of the devotional aspect of Sing God’s Word – Way to Praise. As the children learn the words and music, adequate lessons with visuals and movement will confirm the message from the main verse and help the students understand how these verses can be applied in their daily lives. May your desire to teach the Word of God to children bring as much joy to you as it brings eternal benefits to them. SPECIAL NOTE: Purchaser is granted permission to make copies necessary for teaching in one class unit, not to exceed five copies from one purchase of the Bible curriculum. Personal use is limited to two copies only. The download link for the Coloring Pages is included with this purchase. The specific link will be sent to you by email once your purchase is complete. Tax (if applicable) and shipping and handling will be applied at checkout. This simple Bible curriculum was created for a Sunday school class containing a mixed age group of children, or for early elementary school classes. It is our hope and prayer that this Bible curriculum will provide an easy way for you as a teacher to make the most of the devotional aspect of Sing God’s Word – Run with Jesus. As the children learn the words and music, adequate lessons with visuals and movement will confirm the message from the main verse and help the students understand how these verses can be applied in their daily lives. May your desire to teach the Word of God to children bring as much joy to you as it brings eternal benefits to them. SPECIAL NOTE: Purchaser is granted permission to make copies necessary for teaching in one class unit, not to exceed five copies from one purchase of the Bible curriculum. Personal use is limited to two copies only. The download links for the Coloring Pages and Support Documents are included with this purchase. The specific links will be sent to you by email once your purchase is complete. Tax (if applicable) and shipping and handling will be applied at checkout. This simple Bible curriculum was created for a Sunday school class containing a mixed age group of children, or for early elementary school classes. It is our hope and prayer that this Bible curriculum will provide an easy way for you as a teacher to make the most of the devotional aspect of Sing God’s Word – Psalms in Tune. As the children learn the words and music, adequate lessons with visuals and movement will confirm the message from the main verse and help the students understand how these verses can be applied in their daily lives. May your desire to teach the Word of God to children bring as much joy to you as it brings eternal benefits to them. SPECIAL NOTE: Purchaser is granted permission to make copies necessary for teaching in one class unit, not to exceed five copies from one purchase/download of the Bible curriculum. Personal use downloads are limited to two copies only. The download link for the Coloring Pages is included with this purchase. The specific links will be sent to you by email once your purchase is complete. There is no tax or shipping and handling on this product. This simple Bible curriculum was created for a Sunday school class containing a mixed age group of children, or for early elementary school classes. 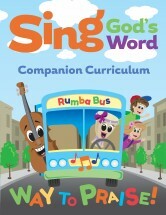 It is our hope and prayer that this Bible curriculum will provide an easy way for you as a teacher to make the most of the devotional aspect of Sing God’s Word – Way to Praise. As the children learn the words and music, adequate lessons with visuals and movement will confirm the message from the main verse and help the students understand how these verses can be applied in their daily lives. May your desire to teach the Word of God to children bring as much joy to you as it brings eternal benefits to them. SPECIAL NOTE: Purchaser is granted permission to make copies necessary for teaching in one class unit, not to exceed five copies from one purchase/download of the Bible curriculum. Personal use downloads are limited to two copies only. The download link for the Coloring Pages is included with this purchase. The specific links will be sent to you by email once your purchase is complete. There is no tax or shipping and handling on this product. This simple Bible curriculum was created for a Sunday school class containing a mixed age group of children, or for early elementary school classes. It is our hope and prayer that this Bible curriculum will provide an easy way for you as a teacher to make the most of the devotional aspect of Sing God’s Word – Run with Jesus. As the children learn the words and music, adequate lessons with visuals and movement will confirm the message from the main verse and help the students understand how these verses can be applied in their daily lives. May your desire to teach the Word of God to children bring as much joy to you as it brings eternal benefits to them. SPECIAL NOTE: Purchaser is granted permission to make copies necessary for teaching in one class unit, not to exceed five copies from one purchase/download of the Bible curriculum. Personal use downloads are limited to two copies only. The download links for the Coloring Pages and Support Documents are included with this purchase. The specific links will be sent to you by email once your purchase is complete. There is no tax or shipping and handling on this product.